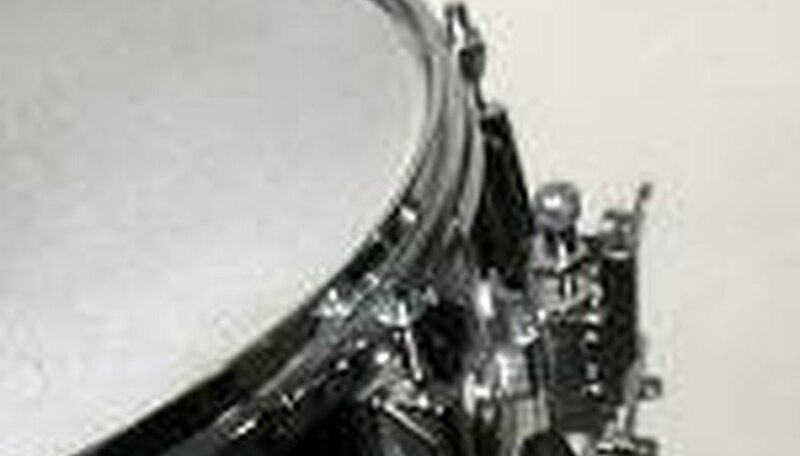 The snare drum is one of the most common percussion instruments of indistinct pitch. The percussionist strikes the top of the drum with a drum stick and the snares (usually cords of wire) vibrate on the bottom. According to the New Harvard Dictionary of Music, the snare drum originally developed from the medieval instrument known as the "tabor." The snare drum probably developed around the thirteenth century as an improved version of the "tabor." The first recorded use of the snare drum was for military purposes, often playing along with the three holed flute that was common at the time. Around this time, during the 1400s, the snares of the snare drum were typically made of rope. During the seventeenth century, new methods of strengthening the snares across the bottom of the drum became common. These new methods provided the "snapping" sound that is quite similar to the sound made by snare drums today. This development was important because drummers could play faster and more complex rhythms with tighter snares. By the middle of the nineteenth century, drum makers began to make snare drums out of brass and reduce them in size from their older counterparts. This new construction method gave the snare drum a brighter sound that was more suitable for orchestral use. The first use of the snare drum in orchestras was for Baroque music with a martial feel. For example, Georg Frederic Handel used the snare drum in his 1749 composition, "Music for the Royal Fireworks."